Safdarjung’s Tomb was the last piece of Mughal Monument constructed in 17th century. 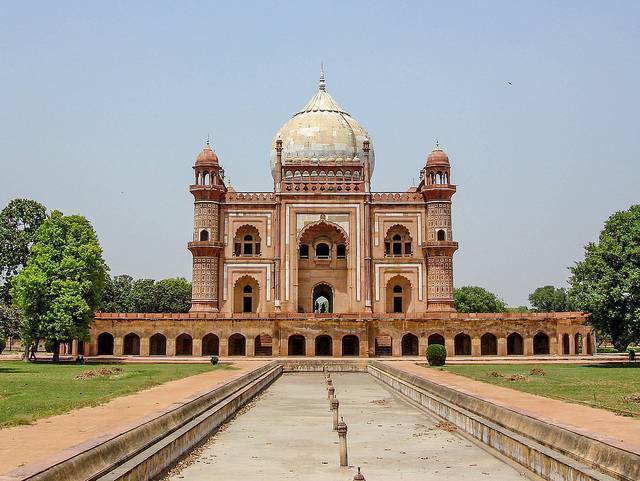 The Tomb is built to honor the Mughal statesman Safdarjung by his sons. Since it was constructed in the declining phase of Mughal Emperor, facts say that sandstones were used and marble work is absent. The main cenotaph was kept over a podium which was wrapped by square patterned garden laid out in Mughal style. There are two water channels one leads to Main gate and other to Pavilion. Ceilings of tomb are decorated with Marble and archers. Four towers were erected on corners of main podium. Due to asymmetrical structures, this tomb cannot be compared with the grand Humayun’s Tomb but is an imposing structure nonetheless.